Hi there, Paul here with a tutorial. I was playing with the idea of a new table for an event in Omaha and was thinking about scatter terrain that would be different than just the hills and trees you see on most tables. 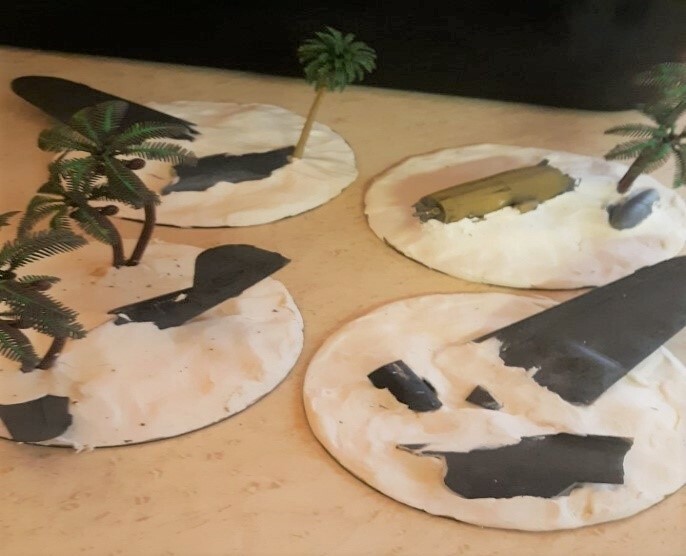 So, I decided that I wanted some terrain that could look good on a board and fill a secondary role as objective markers if needed. 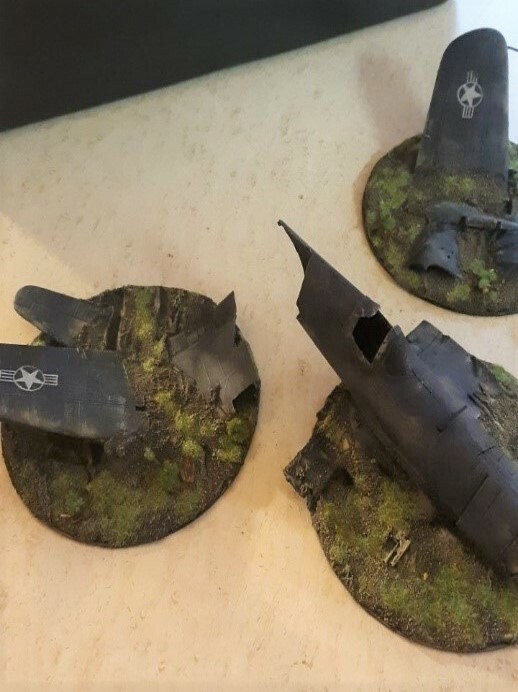 Rummaging around my bitz box (we all have them), I found a broken plane that my dog decided he was going to use as a throwaround toy and since he no longer found the fascination of its untimely destruction, I would use it to create some sight and movement blocking terrain for Bolt Action. So, I grabbed some old DVDs, sorry Space Warriors season 1, you were $2 and terrible, so your five DVD set has now become the latest sacrifice to the hobby gods. I used one DVD and some air-drying clay to create the base. 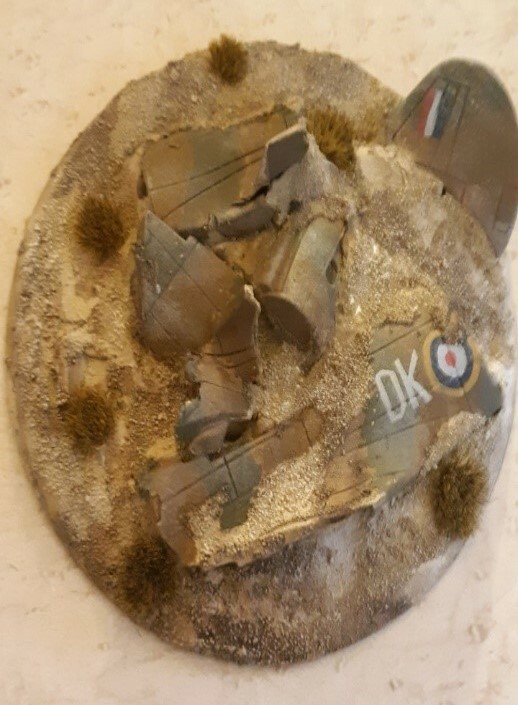 I like using clay as you can push the pieces into to create an effect of the aircraft piling into the group at speed and it covers up where you broke up the model. The next step is breaking up the model into pieces and pushing them into the air clay, I did this for a few reasons. Firstly, the model is too big to fit onto a DVD and secondly, I am cheap, so I broke the one model into three or four pieces to make multiple terrain drops from one kit. Plus, I wanted models to move over the terrain if possible. The air clay does take some time to dry so great opportunity to turn off the hobby chip and turn on the movie chip. The third step is putting sand on the bases and then to prime them to similar colors of the terrain board. I decided to hand paint all the markings as I had used the decals on them already but sprayed over them to make these markers. But in the future, I will build them for this purpose and then decal after painting. 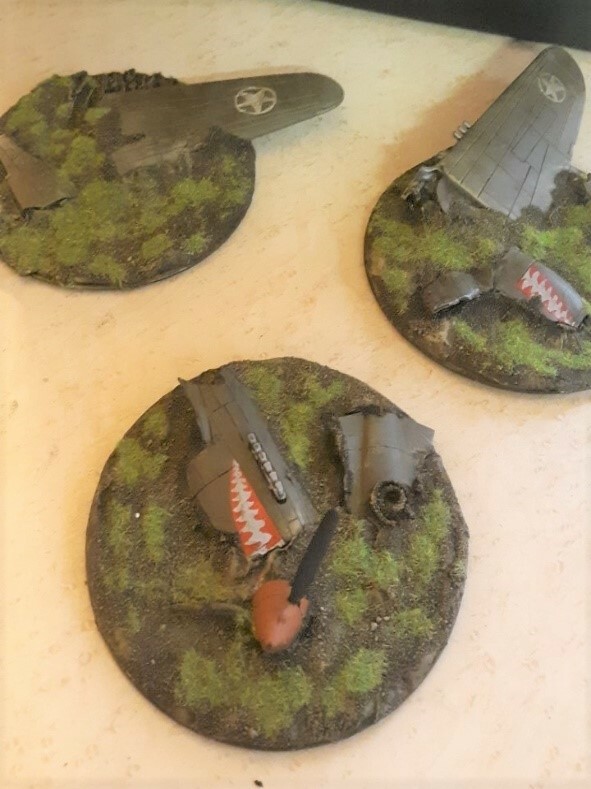 I applied static grass after drybrusing the bases and weathering the aircraft to give them the destroyed crashed into the ground and abandoned look. I think they turned out good and look forward to using them as terrain and objectives in the future.